This card is for the Winter White Out Free for All challenge at SCS. I know this is a week behind but it's better late than never. LOL! I chose these colours just out of the blue and thought it would make a good combination. The gray cs is from SU! and the other one is from Bazzill (which closely looks like SU! Groovy Guava). The stamp is from ebay (I think) and I just randomly stamped it while using a scratch circle frame. The outer frame is from JustRite Christmas set and was stamped with SU! Groovy Guava. 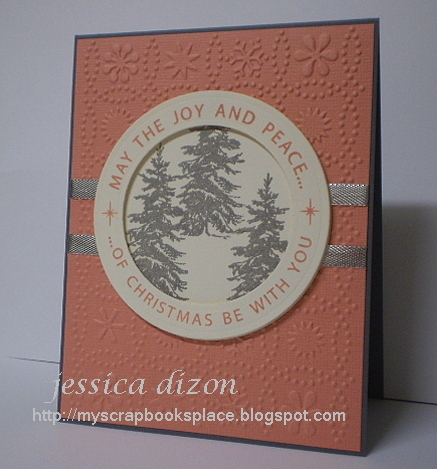 This card is also my entry for Joan's month-long blog candy in celebration of World Cardmaking Day! This is for week 3, I won week 1 :) but missed to submit something on week 2. :( Anyway, hope I'll be able to make cards for the rest of the blog candy weeks. Have a blessed day everyone and God bless us all!